. OD plasticity is preserved in V1 of old EE-mice. 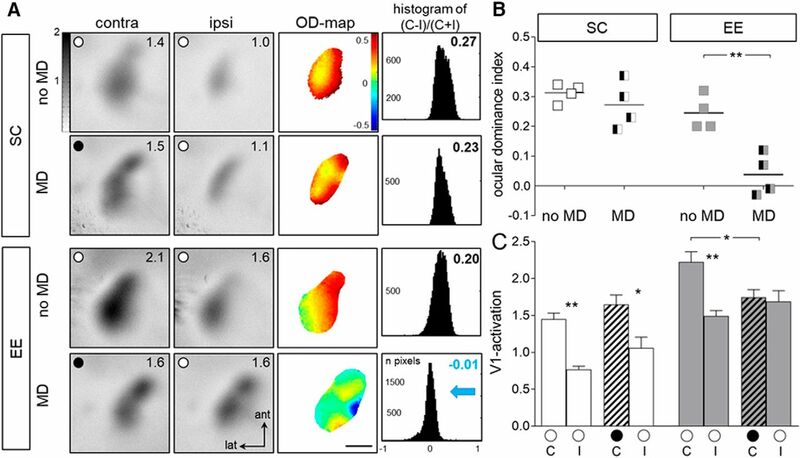 A, Examples of optically recorded activity maps induced by visual stimulation of the contralateral and ipsilateral eye in the binocular part of V1 of SC- and EE-raised mice, without (no MD) or after 7 d of MD. Gray scale-coded activity maps [numbers in the top right corner correspond to the quantified V1 activation (×10−4); see gray scale, left], color-coded two-dimensional OD maps (color codes ODI; see scale to the right of OD map), and the histogram of OD scores, including the average ODI, are illustrated. MD eye is indicated by the black circle in the V1 map, open circles indicate an open eye. In both SC- and EE-mice without MD (no MD), the activity patch evoked by visual stimulation of the contralateral eye is darker than the one of the ipsilateral eye, warm colors prevail in the two-dimensional OD maps and ODI values are positive. After MD, V1 activation changes in EE mice but not in SC mice. Whereas V1 of SC mice remained dominated by the deprived (contralateral) eye, there was an OD shift toward the open eye in V1 of EE mice: after MD, V1 of EE mice was now less strongly activated by the contralateral eye so that both eyes activated V1 similarly, colder colors appeared in the OD maps, and the ODI values were lower, i.e., the ODI histograms shifted to the left (blue arrow). ant, Anterior; lat, lateral. Scale bar, 1 mm. B, C, Quantification of visual cortical activation before and after MD. ODI (B) and V1 activation (C) are illustrated. B, Optically imaged ODIs without (no MD) and with MD: symbols represent ODI values of individuals, means are marked by horizontal lines. MD is indicated by half-black squares. C, V1 activation elicited by stimulation of the contralateral (C) or ipsilateral (I) eye. Hatched bar indicates MD eye. Data represented as mean ± SEM. Statistical significance was calculated using ANOVA and p values were corrected for multiple comparisons. *p < 0.05, **p < 0.01.
. Transgenerational transmission of enhanced OD plasticity from EE mice to their non-enriched SC-raised offspring. A, Optically recorded activity maps of the contralateral (contra) and ipsilateral (ipsi) eye in the binocular part of V1 of SC-raised offspring of EE-parents without and with 7 d of MD. Data display and quantification as in Figure 1. V1 activity maps from two individual animals of each condition (no MD/MD) are illustrated. In mice without MD (no MD, top 2 rows), the activity patch evoked by visual stimulation of the contralateral eye is darker than the one of the ipsilateral eye, warm colors prevail in the two-dimensional OD maps and ODI values are positive. MD (bottom 2 rows) resulted in an OD shift toward the open eye so that both eyes activated V1 more similarly strong, colder colors appeared in the OD maps, and the ODI values were lower, i.e., the ODI histograms shifted to the left (blue arrows). B, C, Quantification of visual cortical activation before and after MD. ODI (B) and V1 activation (C) are illustrated. *p < 0.05, **p < 0.01.
. 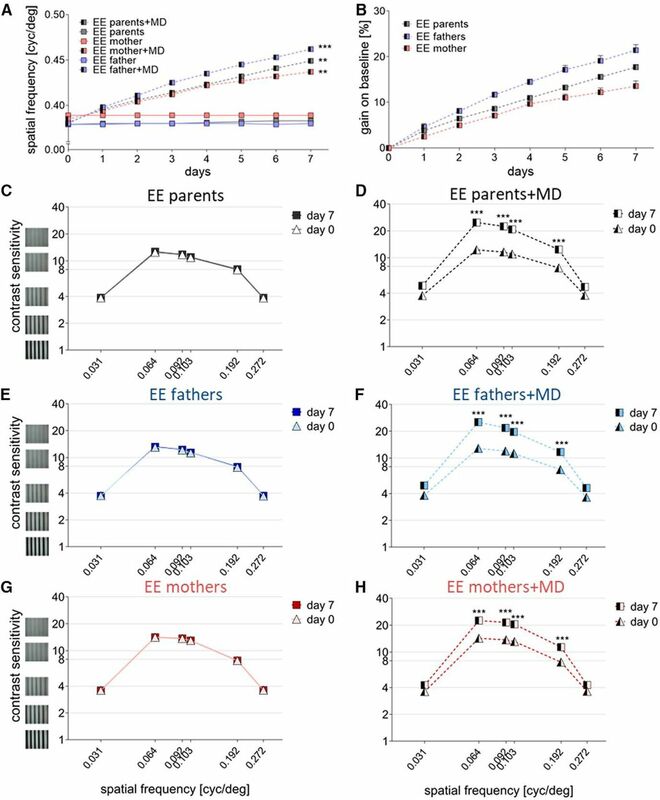 Adult non-enriched offspring of EE-mothers display OD plasticity, but not non-enriched offspring of EE-fathers. A, Optically recorded activity maps elicited by visual stimulation of the contralateral (contra) or ipsilateral (ipsi) eye in the binocular part of V1 of SC-raised offspring of EE-fathers (left column) or EE-mothers (right column) without (no MD), and with 7 d of MD. Data display and quantification as in Figure 1. V1 activity maps from two individual animals of each condition (no MD/MD) are illustrated. 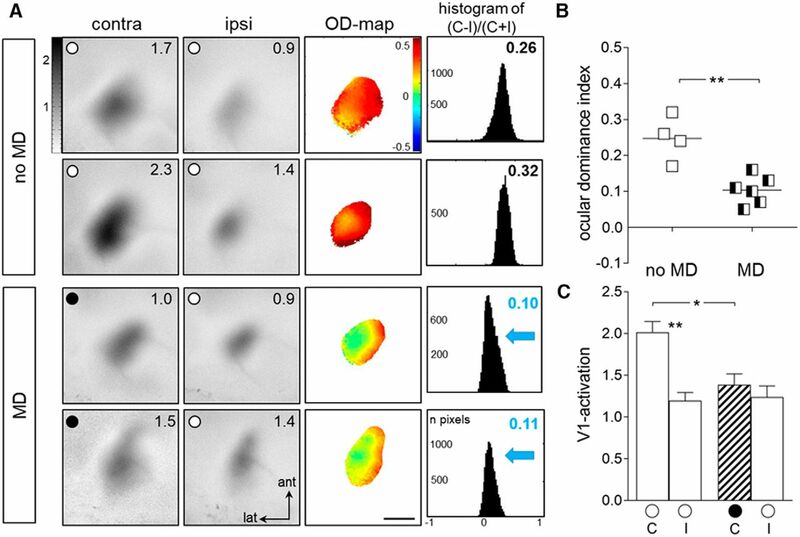 In mice without MD, the activity patches evoked by visual stimulation of the contralateral eye are darker than those of the ipsilateral eye, warm colors (red) prevail in the two-dimensional OD maps and ODI values are positive. After MD in offspring of EE-fathers, V1 remained dominated by the deprived (contralateral) eye in, whereas offspring of EE-mothers displayed OD plasticity, i.e., both eyes activated V1 more equally strong and the ODI histogram shifted to the left (blue arrows). B, C, Quantification of visual cortical activation before and after MD: both ODI (B) and V1 activation (C) are illustrated. Statistical significance was calculated using ANOVA and p values were corrected for multiple comparisons. **p < 0.01, ***p < 0.001.
. Experience-enabled improvements of the optomotor reflex where not different in non-enriched offspring of EE-parents, EE-fathers, and EE-mothers. A, B, The spatial frequency threshold in cyc/deg (A) and gain on baseline (in %; B) of the improvements of the optomotor reflex plotted as a function of days, over 7 d of MD or noMD. C–H, Contrast sensitivity thresholds of the optomotor reflex on days 0 and 7 after MD (D, F, H) or for the no MD-period (C, E, G) at six different spatial frequencies. Note that both the spatial frequency and the contrast thresholds increased after MD in all three groups of non-enriched offspring. Statistical significance was calculated using ANOVA and p values were corrected for multiple comparisons. **p < 0.01, ***p < 0.001. Age and ODI of all experimental animals of each experimental group, subdivided by figure in which data were displayed. The columns in the table from left to right refer to the figures, the groups compared, parameters analyzed, number of animals (N), lower and upper 95% confidence interval of the mean (CI95), distribution of the values (data structure), comparisons of (sub)groups abbreviated as indicated in the parameter column (comparison), test applied for the comparison, and statistical readout (p value). Significance levels were set as *p < 0.05, **p < 0.01, ***p < 0.001. For the six different spatial frequencies tested the average contrast sensitivity for each group is listed as mean ± SEM.